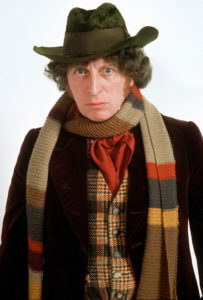 A full view of Tom Baker’s long tenure as the Doctor makes it clear why he became so identified with the character–not just the length of his stay but the commitment to his performance that put a defining stamp on the program. He developed very strong ideas of how the Doctor would behave in certain situations and demanded the story follow suit. While Tom’s character choices for the Doctor remain fairly consistent throughout (though to varying levels of excess), there are clear ups and downs of his seven seasons in terms of the writing. There would be a spate of strong stories with significant moments and then a line of mediocre ones. What worked very well were the tries at creating series of story arcs that linked episodes over a a season. He also had several different companions during his time and it’s hard to say which one seems most well-paired; they all had different and interesting kinds of relationships. There’s no point being grown-up if you can’t be childish sometimes!